You are here: Home / Blog / Blog / What Influence Do Kabbalah Conventions Have On The World? Question: Next month, we will be holding major conventions in North America and Latin America. What influence will these conventions, and the conventions we hold in general, have on the world? Answer: We cannot openly show the world the influence we have. However, we need to first and foremost trust what the Kabbalists write, that we hold great influence. We also need to see how the pace of the world’s development depends on our influence. The fact that the nations of the world blame the Jews for the world’s problems, although it appears as if they point out issues such as the Jews’ disproportionate influence in finance and hi-tech, the deeper reason for their complaints is due to our need to bring the world to a harmonious spiritual state. We have the ability to attract the world to spirituality. As the world rapidly changes, with very fast progress in society and technology, I hope that we will be able to explain to the world what form it needs to acquire. According to Baal HaSulam, in the Shamati article “Still, Vegetative, Animate and Speaking,” we learn that the entirety of creation is at the still level, that is, it doesn’t move by itself, but it is moved by nature. Also, as Baal HaSulam explains in his article “The Peace,” Nature (HaTeva) and God (Elokim), that is, the upper force, are one and the same. Therefore, we are made of the force of creation, which is called “I created the evil inclination.” If we oppose that evil inclination, then we acquire the force of bestowal and perform acts of bestowal, which are against the Creator’s acts, which is called “My sons defeated Me.” That is the vegetative force. With that vegetative force, we exit to the upper world, not as the Creator created us, outside of Himself, but we return to Him, and we can then bestow on and influence the world. That is what we need to do. In bestowal, there are vegetative, animate and human levels, where the entire motion of these levels is in the extent to which we can bestow to the environment, and through it, to the Creator. In the vegetative level, in spirituality as with the vegetative level in our world, it still depends on time and place. Likewise, the animate level, like in our world, is independent from time and place, because it has its own time. It lives and dies, and it also has its own individual motion. In spirituality, such individual motion is spiritual development. However, the still, vegetative and animate are all connected to the environment. The final human level, however, is detached from the environment, rising above all the other levels. We thus need to see that our whole development is in the construction of the correct environment, through which we can exit our initial nature. By drawing ourselves upward from the still form, which the Creator created, we attract humanity after us, whether they want it or not, because they are at the still level. Therefore, our conventions are made in order to accelerate the world’s development. Why is that important? It is because the more we attract the world forward, the more the world will experience positive, enjoyable and harmonious development. Wherever we will fail to attract the world to develop spiritually fast enough, then we will all receive blows from behind in order to help us advance. We thus place a lot of importance and emphasis on our conventions so that as many people as possible will participate. 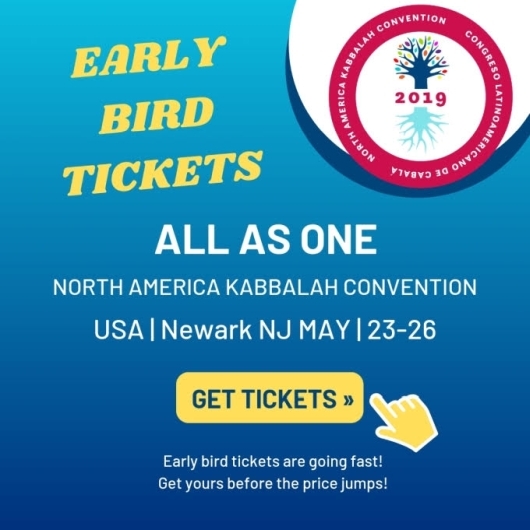 In addition to accelerating the world’s development to a positive and harmonious state, our conventions also provide an opportunity to advance individually in a positive way. In short, the more participants, the more we draw the positive force of development, and thus the more we can advance humanity to a harmonious state in a positive way. https://kabacademy.eu/uk/wp-content/uploads/sites/5/2019/04/astro-awesome-blue-1307986-2.jpg 478 850 Anna Druka https://kabacademy.eu/uk/wp-content/uploads/sites/5/2017/05/logo-color-academy-euec.png Anna Druka2019-04-12 07:57:092019-04-12 07:57:09What Influence Do Kabbalah Conventions Have On The World?